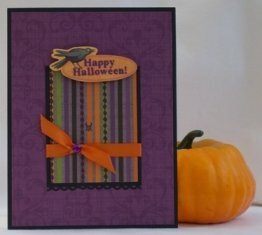 Find lots of examples of handmade cards to make a happy Halloween card. Discover unique Halloween cards ideas with pumpkins, spiders, ghosts and more. I started with a die cut of a row of pumpkins to make a Halloween card. For my homemade card ideas, I love when die cuts come in a large pack because you can make lots of cards out of them and there is an assortment of images. Usually the packs are for scrapbooking but I can still find smaller shapes to fit onto my paper card making ideas. 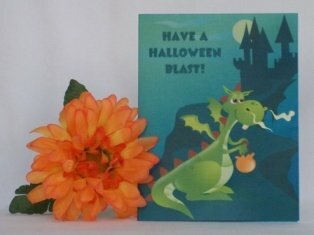 For this Halloween card craft, I used the colors of the pumpkins on the die cut as the colors of my Halloween card idea. I taped the row of pumpkins onto white paper and then onto black paper so that the black would serve as the border. 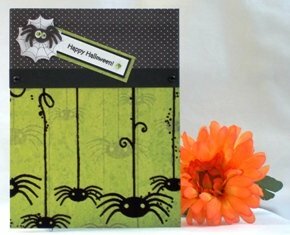 When making Halloween cards, try to use background pattern paper that isn't busy so it doesn't fight with the die cut or image that you are trying to feature. Apply this general rule to your other handmade card ideas. 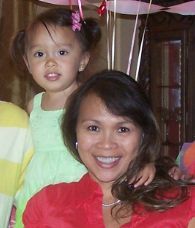 I used a green color that was tone-on-tone. I used black as my border colors because it makes the green color "pop". For many of my homemade Halloween cards as well as with my other homemade greeting card ideas, I type up my sentiment on my computer. You can use a stamp or sticker if you prefer. After I printed the sentiment out, I placed it over black paper and again, used the black paper as the border. 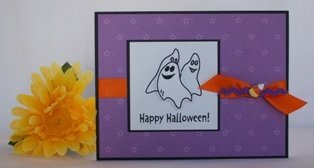 You can make your Halloween card designs any way you want with ribbon, gems and all kinds of embellishments available today. I didn't go crazy with accents for this handmade card making project. I didn't want to take away from the row of pumpkins so I just used an orange ribbon and adhesive gems for my accents on this handmade Halloween card. 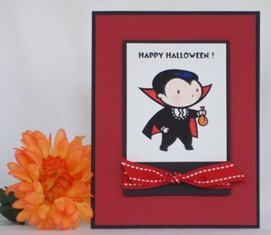 For many of my handmade Halloween cards as well aso my other cardmaking ideas, I like to start with blank cards so I used a black, blank card for this one. 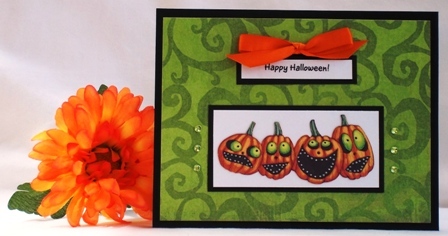 Using blank cards for Halloween card making saves time so that's why use blank cards often. 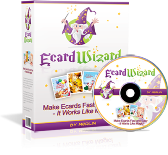 Make Halloween cards for family, friends, a child or coworker and they are sure to love the extra touch and time your put into it. Making unique Halloween cards is special since it can't be found in any store. 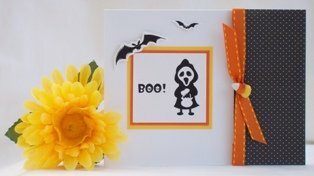 So start building your own Halloween cards before everybody snatches up all the fun paper and cute embellishments.